by Alicia Sevilla and Kay Somers (Moravian College). 2012: This Second Edition of Quantitative Reasoning empowers students to use quantitative information to make responsible financial, environmental, and health-related decisions in their daily lives. Students develop their critical thinking skills through numerous examples, explorations, and activities featuring real data. Students use a variety of analysis throughout the text: inductive and deductive reasoning; tabular, symbolic, verbal, and graphical forms of functions and relations; graphs and pictorial representations of data; interpretations of probabilistic data; surveys and statistical studies. Sevilla and Somer's Quantitative Reasoning, 2nd Edition comes available with WileyPLUS, a research-based, online environment for effective teaching and learning, which takes the guesswork out of studying by providing them with a clear roadmap: what to do, how to do it, and whether they did it right. 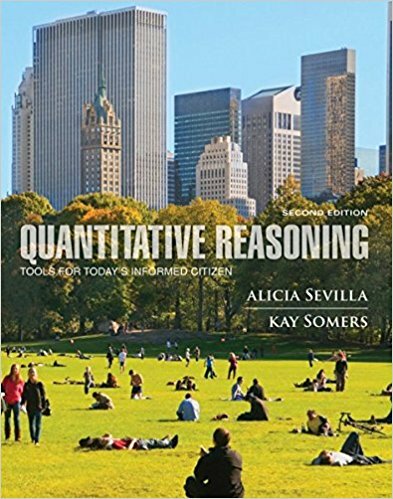 2008 1st Edition: Quantitative Reasoning: Tools for Today’s Informed Citizen helps students connect mathematics in the classroom with applications in the real world. Through a series of hands-on activities and explorations, the text empowers students by teaching them to apply quantitative reasoning skills to make informed decisions in their daily lives. Authors Alicia Sevilla and Kay Somers developed this engaging, activity-based text for students enrolled in an introductory-level, problem-based general education quantitative reasoning course, often called Quantitative Reasoning, Quantitative Literacy, Statistical Reasoning, Statistical Literacy, (Mathematical) Problem Solving, or Liberal Arts Mathematics. At many colleges and universities, this course satisfies a general education requirement in quantitative reasoning. Topic 1: Organizing Information Pictorially Using Charts and Graphs. Topic 2: Bivariate Data. Topic 3: Graphs of Functions. Topic 4: Multiple Variable Functions. Topic 5: Proportional, Linear, and Piecewise Linear Functions. Topic 6: Modeling with Linear and Exponential Functions. Topic 7: Logarithms and Scientific Notation. Topic 8: Indexes and Ratings. Topic 9: Personal Finances. Topic 10: Introduction to Problem Solving. Topic 11: Decision Making. Topic 12: Inductive Reasoning. Topic 13: Deductive Reasoning. Topic 14: Apportionment. Topic 15: More on Problem Solving. Topic 16: Averages and Five-Number Summary. Topic 17: Standard Deviation, Z-score and Normal Distributions. Topic 18: Basics of Probability. Topic 19: Conditional Probability and Tables. Topic 20: Sampling and Surveys. Topic 21: More on Decision Making.